Rory was our first Rhodesian Ridgeback who we acquired in 1985, he was bred by Anne Bates. He gained his his Stud Book number and participated in child Junior Handling where his highlight was winning Best Veteran in Show with the young Helen Mason - which speaks volumes about Rory's temperament! Rory sired 2 UK Champions including the first ever UK liver nose Champion, CH Gunthwaite Corrina of Sonstraal JW and CH KweKwe Kumi. Rory is pictured to the right with Ross and Chloe (Gunthwaite Atania) in a Fancy dress competition. 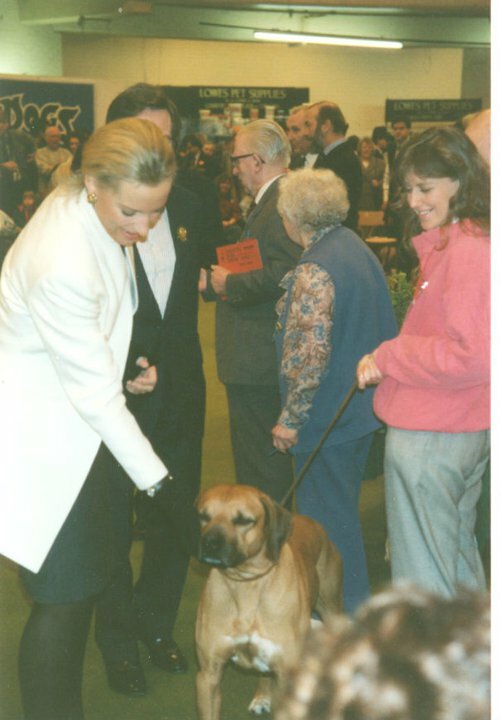 Below Rory and Sharon are brushing shoulders with Royalty at Crufts (Princess Micheal of Kent, behind is Prince Michael). Photo with thanks to Liz Storey.